Les Orchekowsky, Director of the Rotary Foundation for our club gave an informative and entertaining presentation of Rotary International’s Foundation and Paul Harris Fellowship. Les said, "We Rotarians are often asked ‘What is Rotary?’ A simple answer is Rotary is a worldwide service organization, founded in 1905 and today has over 1.2 million members who belong to 35,000 Rotary clubs in more than 200 countries and geographical areas. Since 1985 Rotary’s goal has been to eradicate polio worldwide." The PolioPlus campaign has committed more than $500 million (US dollars) to the protection of more than two billion children in 122 counties. For instance, SV Rotarians for the past 16 years and under the guidance of Rotarian Jim Evans have traveled to Caborca, Sonora, Mexico to assist Mexican Rotarians and medical staffs administer oral polio vaccines to infants. Evans is now turning over the reins of the Caborca initiative to fellow Rotarian Dan Crews for the 2018 trip and beyond. In 2007, the Bill and Melinda Gates Foundation joined Rotary in its commitment to ending polio and have matched every $1 Rotary commits to polio eradication 2-to- 1. To date the Gates Foundation has contributed more than $1.6 billion to end polio. Rotary’s campaign proudly states that we are that close (showing human fingers within one inch of one another) to ending polio forever worldwide. Only three countries have reported cases of polio worldwide. Les added: "when we stop it in those countries and after a 3 year waiting period with no evidence of additional cases, we can officially declare victory over polio." He then presented a special award to Elsie MacMillan for achieving her Paul Harris plus 5 pin. 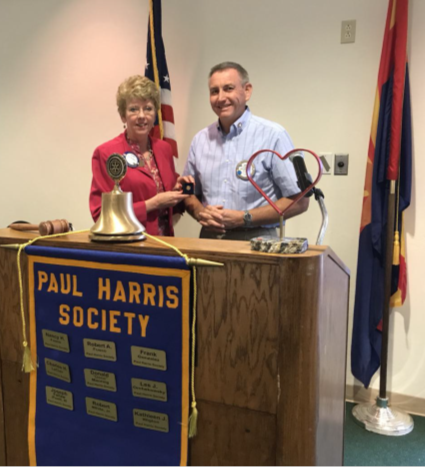 Les also recognized Club President Nancy for becoming a Paul Harris Society. Rotarians roundly applauded Les for turning what could have been a dry subject into a highly informative and entertaining performance. Just what he intended to do. President Nancy also announced that we are doing a fund raiser at Chili’s to support our District Grant Forgach House project with monies donated to The Rotary Foundation. Rotarians and the public are invited.